After Japanese forces occupied the Philippines in early 1942, American civilians and other Allied nationals were forced into internment camps. The camps had a plethora of rules, including a ban on “commingling”–an enforced separation between adult men and women, including husbands and wives–and rules on what women could and could not wear. Camp commandants demanded that women be “decently” attired at all times with discreet necklines and long skirts, just like proper Japanese women. But because of the almost unrelenting heat of the Philippines, American women tried to get away with as few articles of clothing as possible while remaining seemly by their own standards. In the Santo Tomas internment camp in Manila, women were particularly forbidden to wear shorts of any length. The camp’s civilian Executive Committee, run by men of the Allied countries, approved of the ban no matter how much the women resisted, believing they were saving their women from the possibility of sexual assault by the Japanese. However, by the end of 1943, clothing was in such short supply that the Japanese agreed to relax the ban. Women could wear shorts that were no more than four inches above the knee. To take control of their appearance and to reassert American traditions, the women in the Baguio internment camp celebrated Easter of 1942 by attending a sunrise service with their families, then staging a parade during the Sunday night socializing hour. Almost every adult woman created a new Easter hat, long an American tradition, and joined the parade. Missionary Fern Harrington recalled that “shrieks of hilarity punctuated the afternoon as the women fashioned their hats.” She covered a strawberry basket with a variety of flowers she had picked the day before. Harrington declared that the “smartest” hat was the one made from a roll of toilet paper tied to a woman’s head with a ribbon. Another woman wore a branch on her head adorned with a paper bird. Yet another hung onions from her ears as earrings and arranged long green sprouts on her head. The parade was a big success. The internees laughed as they thoroughly enjoyed themselves, that is, until the Japanese guards heard the commotion and moved in to break up the event. It had been one of a few bright spots in what would stretch into three years of life under an enemy occupation. Want to know more about American women’s experiences under internment? 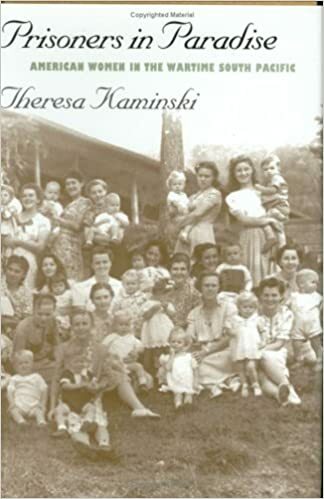 Read Prisoners in Paradise: American Women in the Wartime South Pacific. Reblogged this on Hints and Echoes. Thank you for this inspiring Easter Sunday post! Thanks for reblogging, Mary. The Easter parade story is one of my favorites from those internment years.